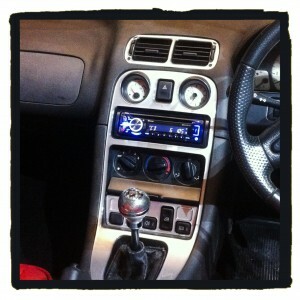 The car has a custom stereo install, mostly because Chris had all the speakers, amps and wiring lying around his shed. After Mick had done a great job of making a speaker enclosure to fit between the front seats, Chris decided to just pop the head unit into the dashboard. Normally this would be a very simple and quick job, about 10 minutes at most. Not only did it require the ordering of specialist connectors to convert the signal cables, that run to the amp, to right angle exit but it also meant that half the lower dash had to come out. Long story short, both lower console light panels, the dash binnacle and the glovebox came out so that the radio could be slipped in while the cables were gently massaged out of the way. It is not unknown for cables to require right angle adapters but in 25 years of installing car stereos, Chris has never had to connect them once the stereo was already in the dash, from behind. Install time, around an hour!